1. Light the barbecue and allow it to reach a good cooking temperature. Halve the peppers lengthways and shake out the seeds. Set aside six halves and thinly slice the remaining two. 2. Heat the oil in a large pan, add the onions and sliced peppers and cook for 10 - 15 minutes, stirring often, until softened and dark golden. 3. Spoon the mixture into the pepper halves and top with slices of cheese. Press a thyme sprig on top of each one and grind over some black pepper. 4. 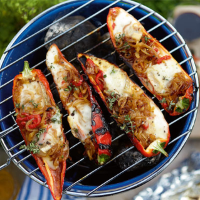 Cook over medium coals on the barbecue for 15 - 20 minutes (or 10 minutes under the grill) until the peppers are tender and the cheese has melted. Splash over a little balsamic vinegar and serve hot. If your barbecue has a lid, close it to help cook the food evenly. It may also reduce cooking time, but keep a close eye on the coals in case of any flare-ups. This dish can be prepared ahead up to the end of step 3 and chilled until ready to cook.